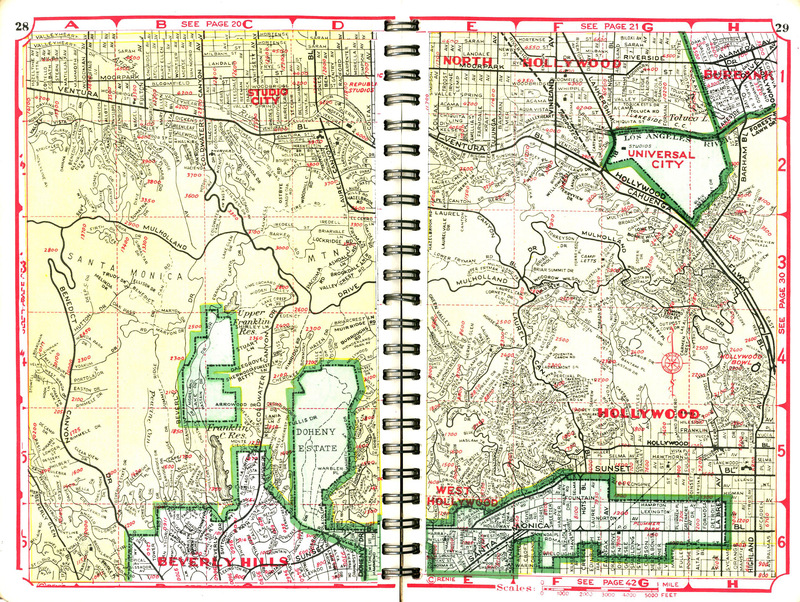 These pages of an early Renie atlas sing two interesting birdsongs of Los Angeles history. On the left we have the 16-acre Doheny Estates, some of the most coveted real estate in all of Los Angeles. Originally, the land was presented by Edward L. Doheny as a gift to his son Edward Jr. aka Ned, who erected the 46,000 square foot, 55-room Greystone mega-mansion on the grounds, polishing it off with a formal English garden. With a price tag of $3 million in 1928, it was the priciest private home in all of California at the time. Yet, as they say, money can’t buy happiness. Just four months after his family moved in, Ned was shot dead by his secretary and intimate friend Theodore Hugh Plunkett, who shortly thereafter shot and killed himself. Exactly what transpired in the final moments of the two men’s lives will never be known. Ned’s widow, Lucy, remarried and continued to live in the mansion until 1955, when she sold the home to Henry Crown and the estate to Paul Trousdale, who subdivided it and built houses. The Trousdale Estates, as they were called, became the place to hang your hat for celebrities like Elvis, Groucho, Ray Charles and even Richard Nixon. 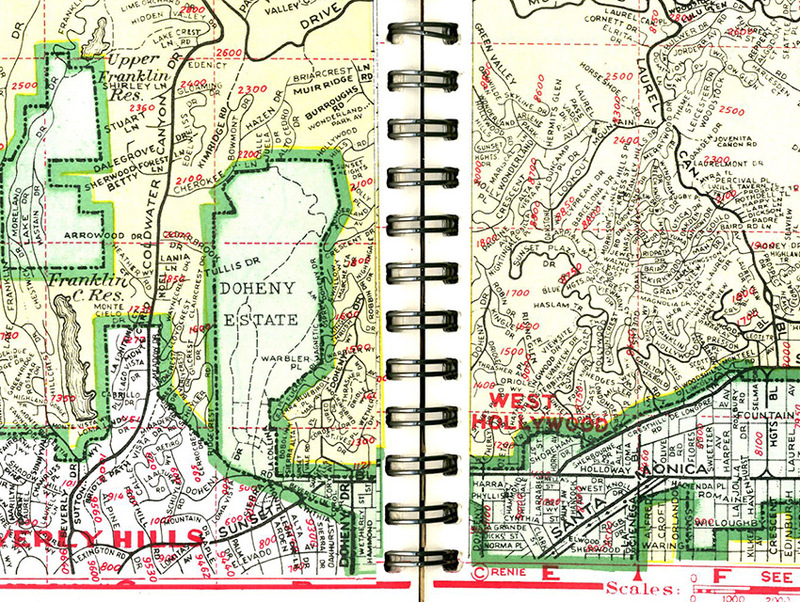 Eventually, in 1965, the City of Beverly Hills bought Greystone and, in 1971, turned the grounds into a public park. The famed mansion was included on the National Register of Historic Places in 1976. Within whistling distance of Greystone are the Bird Streets of Hollywood Hills (or Beverly Hills or West Hollywood, depending on which realtor you’re dealing with when shopping for multi million dollar homes). The Bird Streets began appearing in 1924 and continued to emerge right on up into the 1960s, when Blue Jay Way—the street that inspired George Harrison to write the song of the same name—was added. To this day, Oriole Drive, Oriole Way, Oriole Lane, Tanager Way, Thrasher Avenue, Skylark Lane, Nightingale Drive, Robin Drive, Swallow Drive, Kinglet Drive, Thrush Way, Warbler Way, Warbler Place, Flicker Way, Flicker Place, Bluebird Avenue, Bobolink Place, Mockingbird Place, and Vireo Drive tweet their very expensive song from up in that rarified Hollywood Hills air. The neighborhood is known for spectacular views and is one of the most exclusive enclaves in Los Angeles. Leonardo DiCaprio, Tobey Maguire, Jodie Foster, Keanu Reeves, Herbie Hancock, Stan Lee, Larry Flynt, and Christina Aguilar are just a few of the famed who have nested on the Bird Streets. Jennifer Aniston was reported to be renting there at a mere 20 grand a month, and Dr. Dre just sold his Bird Streets home for $35 million. It’s an area where real estate affordability has reached all time basso profundo, and the average price to buy ranges from around $4 million to nigh infinity. The Bird Streets may be the only place outside of Malibu where teardowns can run for seven million bucks. It was here that many a famed architect once carved their niche in Los Angeles design history, and only recently has the fever to live on these star-studded streets brought with it the lust to knock down the old to make way for the more ostentatious.